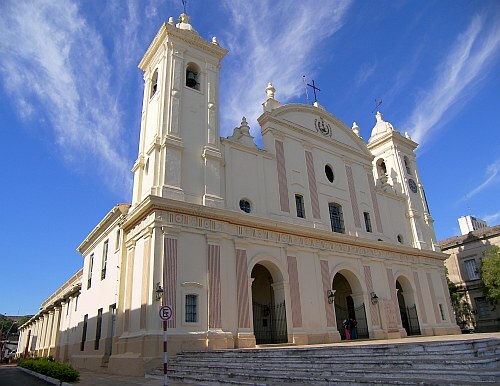 COPA Airlines and Avianca have dropped the price of their flights from Montreal to Asuncion, Paraguay down to $711 CAD roundtrip including taxes. This is 40% below the typical best roundtrip prices from Montreal to Paraguay. The flights have 2 stops each way, in Panama and Lima, Peru. Paraguay is nestled between Argentina and Brazil down in South America. 3. Click through from Google Flights to FlightNetwork to make the booking. flight deals, south america, copa airlines, vancouver, yvr, asuncion, paraguay, asu and avianca. 2 Responses to "Montreal to Asuncion, Paraguay - $711 CAD roundtrip including taxes"
Thank you Chris!!! 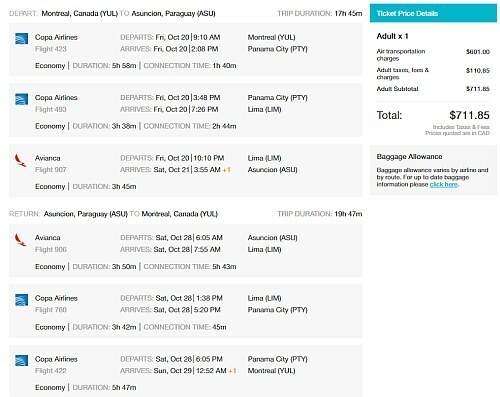 - I just purchase this ticket from October 27 to November 14, and it cost me CA$711 + $34 commission fee of my travel agent, so I am going to South America soon!!! and in November it is summer over there, without being so hot yet!. Nice! I'm glad it helped you Hector. Have a great time in South America!